Solihull Barons Invite Youth Groups To visit one of Their Home Matches FREE ! Do you run or have links with a youth group that offers services to children under the age of 16 years ? Youth clubs, football clubs, swimming clubs, scouts, boys brigade etc..... Would you like to be able to bring your youth group to one of our home games free of charge ? 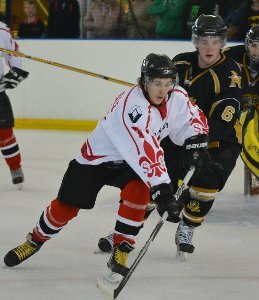 The Barons are actively trying to encourage the participation in sports, and the well being and fitness of children while also promoting the sport of ice hockey in the West Midlands. We can offer free admission for up to 20 children and 5 adults for each group. Prior to each game a coach, player or member of the off-ice team will give the group a small introduction to the game and some of the basic rules. After the match you will have the chance to shake hands with the players. A Truly fantastic and well organised experience. On behalf of all from Bromford Lions Under-9s Football Club, We can’t thank you enough for a brilliant evening out for the both the players and their families (which included both boys and girls of all ages from 3 to 13). We were all warmly greeted at the entrance by Richard (who was the best) and taken through to a private party room, Where our host Richard, gave a jovial over view of the barons, the game, the players and the arena; Following which we were then shown to our fantastic seats in the raised section behind the goal; which provided us with the best view in the arena. None of the party had attended Ice Hockey before and we were not sure what to expect but wow! It’s so fast and furious; the kids especially were totally engrossed in the non-stop action. What also added to the occasion was the sound track, which played out some great background music throughout the evening. It was also great that at the start of the match the players lined up for the playing of God Save the Queen (nice touch). There was added spice to the game as it was a challenge match against local rivals Telford Tigers – which, to all of our enjoyment, the Barons came out 5-3 winners. During the intervals and the match, the kids enjoyed the freedom to move around the arena, dipping in and out of the mini arcade, whilst enjoying food and drink. It was great to see the kids being able to hang around together as mates and enjoy just being kids. The safe environment allowed some of the parents to enjoy a relaxing drink in the bar. As a youth group we do arrange many trips for the kids, we try to help them increase their awareness of sport and this without doubt was simply the best experience so far. Our thanks again to Richard and the Barons, you’ll most definitely be seeing us again. Bromford Lions (Junior and Youth) Football Club.